October 4, 2012 October 3, 2012 1 Comment on Lobstick: Canada’s next symbol? 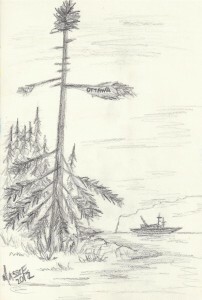 “The Sentinel.” Drawing by author. When Senator Nicole Eaton called for Canada to declare a new biopolitical symbol in the fall of 2011, she suggested replacing the ‘dentally defective rat’ –– known as beaver, or castor Canadensis –– with the perhaps more ‘stately’ polar bear. In one simple suggestion, she set off a firestorm of controversy across Canada’s social and public media landscape. My students in the western Canadian history class at the University of Saskatchewan took a straw poll. By show of hands, who wants the beaver as the national animal symbol? Who wants the polar bear? The orange–toothed rodent won, by an enormous class mouthful. The polar bear? Too much connection between a certain cola beverage and their commercials, let alone the red and white colours. We do not, they declared, require a rebranding campaign. The beaver has served us long and well. It is, as so many of my environmental students declare, the closest to humans in terms of its ability to reconstruct the world to suit its particular wants and needs. I would like a still pond, nice and deep. I can’t find one. I know! I’ll make one! Here is a lovely brook rimmed with tasty trees; I’ll busy the bicuspids. As I ponder the continued popularity of that pesky rodent –– for I grew up on a farm where we trapped and hunted beavers, or blew up their land–soaking dam–nifications––I wonder if the time is now ripe to launch a campaign to change, or at least add to, our Canadian biopolitical symbols. I hereby launch a petition to add the lobstick tree as a symbol of Canadian identity. What is a lobstick? Haven’t you traveled to Jasper, where Lobstick Lodge welcomes visitors? Or perhaps you are a golfer, and attend the Lobstick golf tournament each year, held at Prince Albert National Park? Lobstick symbols are scattered throughout the Canadian cultural and natural landscape. 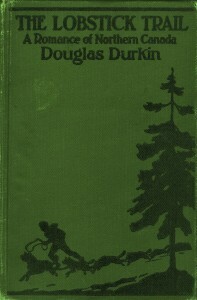 Cover of Douglas Durkin’s The Lobstick Trail: A Romance of Northern Canada (1920). Culturally modified trees were once common in Nordic countries, among them the lobstick tree of the Canadian boreal forest. 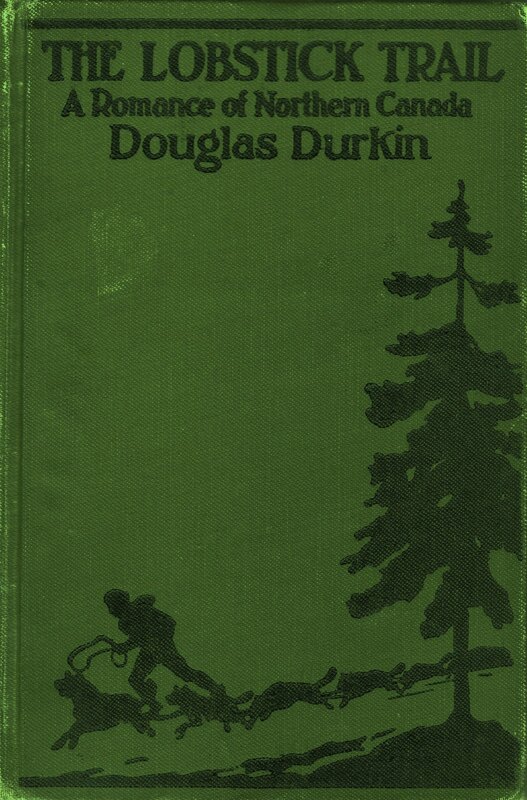 Douglas Durkin, a writer of northern romance novels, used the lobstick tree as a symbol of the north in his 1920 book, The Lobstick Trail: A Romance of Northern Canada. Margaret Atwood wrote poetry about them in 1970. Gwen Hayball wrote of the lobstick in the Canadian Geographical Journal in 1973. Lobsticks were also cultural markers, used to designate meeting places, burial grounds, ceremonial sites, and even personal totems, or to honour a guest or visitor. Lovers would make them to mark trysting places. Explorer Alexander Mackenzie was one of the first Europeans to comment on lobstick trees, and in his assessment they “denoted the immediate abode of the natives and probably served for signals to direct each other to their respective winter quarters.” Warburton Pike, an Englishmen who traveled into the far northern tundra in search of big game, also commented on these markers: “many an appointment has been kept at [lobsticks],” suggesting their role as a convenient meeting point that everyone can find. 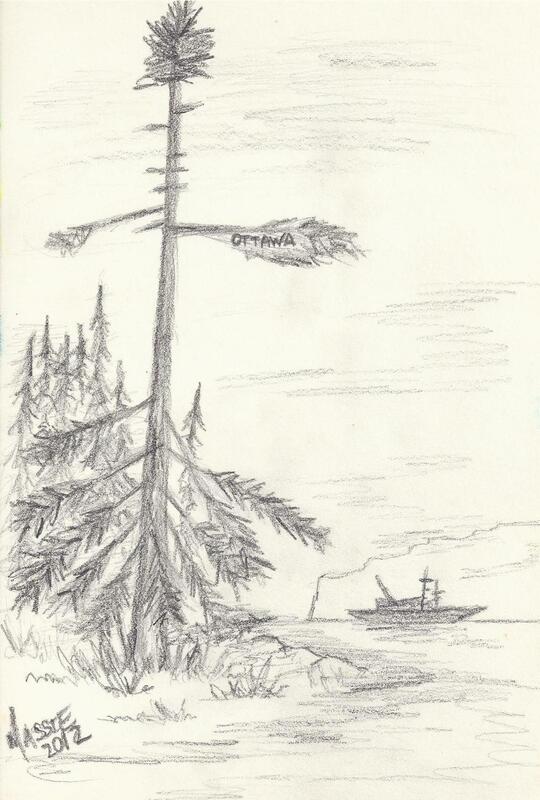 Caroline Podruchny, in her book Making the Voyageur World: Travelers and Traders in the North American Fur Trade (University of Nebraska Press, 2006), documents the physical creation and the symbolic meaning of the lobstick tree for voyageurs in Canada’s north. In that version, all the branches would be removed (except the very topmost), leaving a tall tree often called a ‘maypole.’ Sometimes the bark would be removed, leaving a smooth surface to cut names, dates, or symbols, or simply to shoot patterns into the tree with gunshots and powder. A particularly cheerful version was created for Frances Simpson, wife Hudson Bay Company governor George Simpson, with feathers and streamers for decoration. A lobstick, according to Podruchny, was created to honour a new leader, particularly if it was his first trip into the northland. To repay the voyageurs for the honour of making a maypole/lobstick tree, the leader was expected to offer presents, or at least a generous measure of rum. It seems clear that in the voyageur world, the trees were created for their symbolic meaning – and, of course, to have a party. There was a lobstick tree north of Prince Albert where I grew up, near what is now the village of Paddockwood, Saskatchewan. Pictures and stories from the earliest Euro–Canadian settlers describe a huge evergreen sitting in lonely splendour in a field of grass, at a height that could be seen for miles in every direction. It offered a scenic picnic spot –– until it either died of old age or succumbed to the will and axe of the homesteader that wanted patent to the ground beneath the giant’s roots. What I like about the lobstick is how it is both natural (a tree) as well as culturally modified (shaped, changed, and adapted; marred or scarred)–– in many ways, a fitting symbol of Canada itself. It is distinctly northern and boreal, evoking the dreaded wilderness of Atwood or the home of Joseph Boyden. As climate change opens Arctic waters and change stalks the northern air, we could consider once again creating a few lobsticks. They would be there, at the very least, to guide visitors. With the numbers now moving through our sovereign area, directions might not go amiss.